We’re going to show you how to optimise your home office or professional working environment with Knoll furniture…and why it’s important. Ever dream of escaping the desk and just working wherever you want. Comfortably, stylishly, practically. The term the ‘desk is dead’ has been thrown around this year with a lot of scrutiny. We have as a society grown to believe that working means, sitting at the same desk, on the same chair, in the same place 5 days a week. With most business now being virtual never before have we been able to move away from this idea of how ‘working’ should be. Your business growth isn’t calculated by how many hours are spent sitting down, but what you do with time you put in. Productivity rates are being enhanced and encouraged by companies in a number of ways. Optimising the working environment has never been a more crucial element of design. By providing spaces designed to enhance productivity. Such as aesthetics, temperatures, biophillic design and a variety of work spaces. From this we have seen a knock on effect of employer happiness, mental health improvements and of course, the amount of quality work being produced. The next key element for environment is allowing work to be done not only inside the office but from effectively anywhere in the world. Including your own home. In a recent article from Dezeen entitled ’10 office furniture designs that prove the desk has had its day’ Hitti shows us innovative new design collaborations from brands we love such as Vitra and Barber & Osgerby who are set to launch a modular seating system that doubles as a work station. The designers said “with mobile technology you need a place to sit occasionally, or a comfortable place to hang out,” and we strongly agree. Especially in instances where people work from home. This usually infers that a person would have a ‘home office’ or a desk to work out. But new designs such as the Avio Sofa from Knoll allows us to utilise exisiting pieces within the home and convert them from a home comfort into a practical working space. 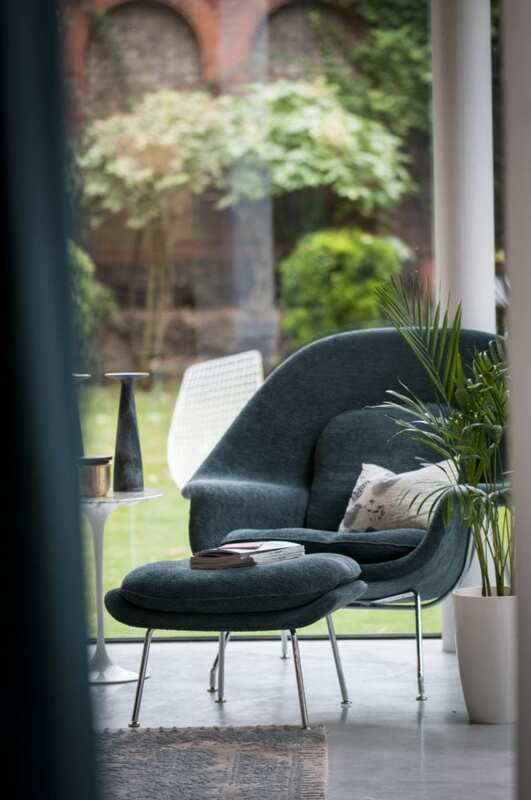 5 Key Pieces You Need From Knoll – Order Your Brochure for the NEW collection or to discuss any items below click here. This amazing and super cool sofa has been used in a handful of our recent projects after it made its debut at the NW3 showroom. This is because it provides a multifunctional aspect that we can’t get enough of. The modular system allows for the sofa to be uniquely designed to you and your space as well as having a pivoting end to make for a communal space or to allow for a side table to slip through the components. Creating a table space for a laptop, coffees, reading and writing. This new feature from Knoll turns an everyday household piece into a productive and comfortable working space. Latest developments in work spaces is to encourage standing, instead of sitting. Finding that people work more efficiently when they aren’t stationary for long periods of time. This of course can have multiple benefits for your physical and mental health and can assist with a myriad of back, neck and leg related issues that are linked to a sedentary lifestyle. The desk is designed to be electronically adjusted for both seated and standing work. Offering a perfect solution from Knoll for an office or residential space. 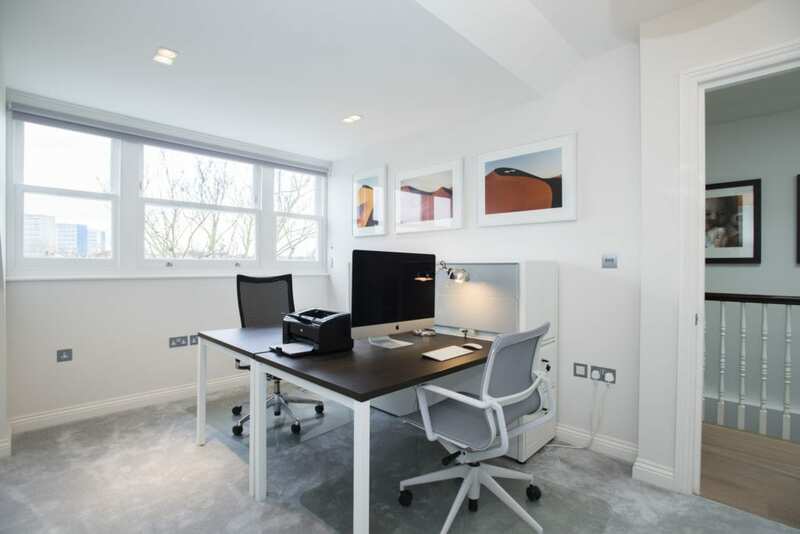 We recently used it for a client at our project in Beaconsfield to accommodate the couples working habits, one standing, one sitting, just one desk. View the space here. Due to new GDPR rules …(yes we said it…sorry) many people who work from home now have to keep client information under lock and key. 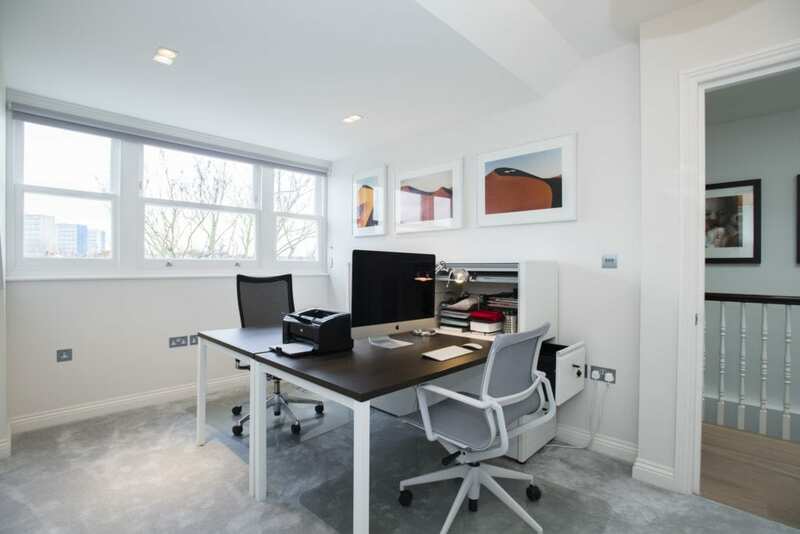 Privacy and security go hand in hand, so to save yourself coming under the firing line why not include some sleek modern Knoll office storage in your home like we did for our lovely client in our Little Venice project. Turning their spare bedroom into a functional, beautiful and practical office space. Named for why it was designed, for life. For the every day life. To make sure you’re fully supported all day every day. If you think about it, 8 hour days mean we’re often sat for over 40 hours a week. That’s not good for any body! But if you’re thinking stand up desks aren’t for you, then make sure you chose a chair that is. Ergonomically designed to fit you like a glove, the life chair offers flexible and consistent support. If you’re preparing for a lengthy business call, why not do it in a chair that makes it feel like you’re being bathed in cotton wool. With an array of gorgeous and durable materials and with an accompanying footstool, you can put your feet up ready to take on any stresses of a 3 way conversation, dodgy connection or an incompetent colleague. And maybe for no other reason than no home is complete without one. To order any Knoll pieces, to discuss your home or office space, get in touch with one of the NW3 Interiors team now. 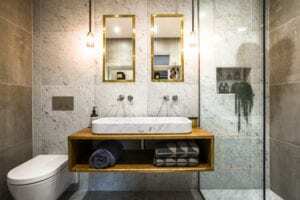 We’ve now shared 3 of our recent interior design projects – and you can read all about them here – but our blog this week has a slightly different story arc. 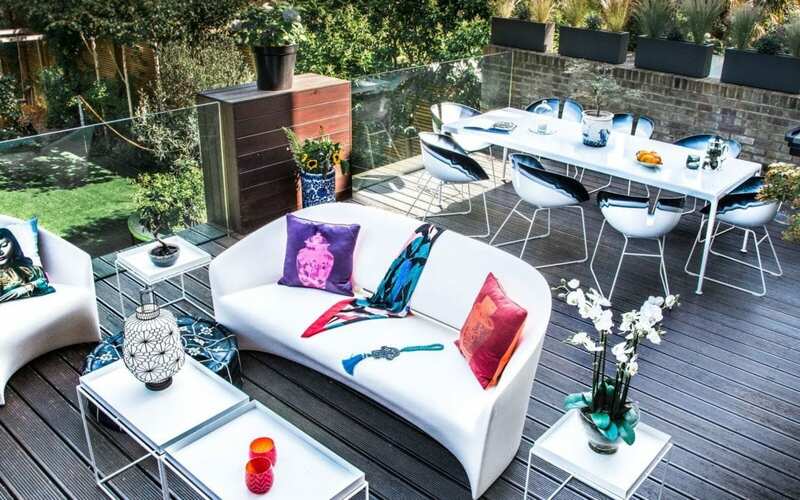 Over the last few months Carly and NW3 have been working in Primrose Hill, helping a client revolutionise their outside terrace, and it’s been exciting and rewarding. Our client’s garden terrace features a large section of dark brown wooden flooring, and NW3 were tasked with bringing the area to life. This client’s outgoing lifestyle involves lots of hosting, so we needed to create a vibrant area that was also functional and practical. It’s important that the design work could create a garden to be used all year round with relatively low maintenance. Originally fixated on wooden furniture, we managed to persuade our client of the benefits of more durable materials. The dining table (pictured) is a Knoll classic, designed by Richard Schultz, and was manufactured in Italy. Fortunately, shipping was super-fast and the table arrived quickly! Paired with the table were the dining chairs, procured from the beautiful Italian brand Moroso. The chairs added key details with white, dark blue and black, complimenting the client’s design briefs. Carly’s drawings also enabled the height of the side of the chairs to fit in with the requirements for the tables – a crucial calculation, as we all know. Finally, the sofa and armchair selection were chosen for outdoor suitability, and spiced up with a variety of cushions thrown on! The white of the sofas, despite the client’s initial hesitation, contrasted the brown floor perfectly. Coffee tables from Hay and honeybee lanterns from Serralunga completed the space. Throughout the project, Carly co-ordinated multiple suppliers and organised the installation. Using NW3 meant the client’s terrace is now full of colour, lasts all winter, and has been professionally designed whilst utilising discounts available from suppliers. 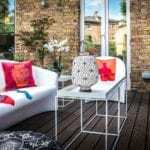 See the outdoor terrace in all its glory on our project page here. Designed and sourced exclusively by NW3 Interiors. 1) How did you know of NW3 Interiors and what was it that attracted you to instruct us? Carly has established for herself a fantastic reputation as the go to person in North London. Having worked with a few interior designers in the past she is the only person I will speak to now. She has a brilliant eye and an excellent relationship with all her suppliers. Her service is seamless. She always makes her herself available and is not happy until the job is 100% done. 2) Can you recall which important pieces of information you provided to NW3 Interiors to ensure the design was suitable for your situation? I told her not white! The best advice I can give is to trust Carly and believe in the process as she is always right as white is the only colour I would put out there now! 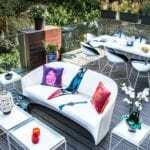 She was very practical as I also wanted outdoor cushions and she advised me that with the weather being what it is in this country we needed something more durable. Now we have patio furniture that not only looks amazing but will work all year round! 3) What feedback would you give regarding the process from design concept to completion including time and value? Carly came over and did all the measurements, sent us digital images of what it would look like when completed and we loved this! Carly always finds us the best possible deal and always manages to work around our budget. 4) How does it make you feel now, to sit on your terrace? Very happy indeed. As always, Carly nailed it!